"The National Road Bikeway will remain closed until Thursday at least, according to the St. Clairsville mayor. 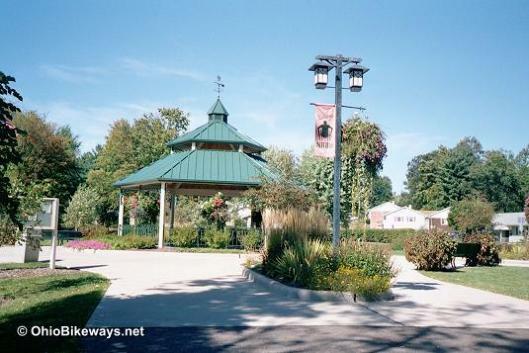 Facilities: Water fountain & benches at the gazebo. Portable toilets may be available. Worth Noting: The tunnel is closed periodically for repairs and/or maintenance work. The trail manages to keep a level plane by burrowing through a hillside by way of an impressive 522' tunnel and skimming over a valley with a 342' over-street bridge. There's a great view from the wooden decked bridge. The tunnel is simply magnificent. Originally constructed in 1902, it has been rehabbed a few times since. It's lighted and holds an impressive 42' high ceiling. A few puddles lie here and there on the trail surface inside. They are formed by trickling ground water that seeps through the upper structure from the earth that rests on top, some 80' above the trail surface. There's definitely a cave-like feel when you ride through and a noticeable temperature change as well. Another lighted tunnel was constructed in 2014 along the trail. 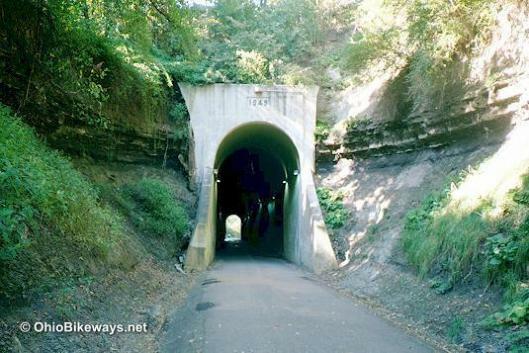 It's spans 250' underneath I-70 and lies a mere .6 mile south of the National Road tunnel along the bikeway. You can get a bird's eye view of the trail by climbing a series of stairways that reach a viewing platform atop the National Road tunnel at its northern entrance. The restoration of the existing railroad bridge and tunnel certainly make this bikeway a very interesting ride, but the trail designers didn't stop there. They decided to create their own unique centerpiece. They built a gazebo on the trail. Not alongside the trail, but right in the middle of it! It may sound odd, and frankly, I'm not sure I like it. But I have to give them credit for trying something very different. The gazebo is nicely done and beautifully landscaped. There are benches, flowers, and a walkway that circles the structure. There's also a separate nature trail nearby. Since the gazebo is directly in the path of trail users, it forces them to take notice. And my guess is this was part of the designers plan, making it a focal point. Had it been placed off to one side, it would most likely have served as mere decoration. What may be at the heart of this trail's appeal is the overall plan and design of the bikeway. This project wasn't a "hey, let's put down some asphalt and call it a bike trail." It encompassed not only restoration of historic structures, but integration of a new structure and trail into the local community. In the past, this trail was reported as being 4 or more miles long. That distance included on-road bike lanes that connect nearby neighborhoods to the trail. The trail itself is 2.5 miles in length. Sometimes the reported lengths of Ohio trails are inflated. Perhaps the thinking is that if a trail seems too short, people may not be as inclined to check it out. No worries when it comes to the National Road Bikeway. It's definitely a worthwhile visit!